The RSP-200 series are reliable, economical, 'light industry level' power supplies. The series consist of 200 Watt AC/DC, low profile, single output, enclosed type, switching power supplies. The low profile (30mm height) design works in 1U applications, is efficient, and with fan-less natural convection (free air) cooling, silent. The original SP-200 series was very good. The REDESIGNED RSP-200 series are outstanding: 24.7% smaller, and 6~19% more efficient than the original SP-200 series (200W). The -30~+70 ºC ambient operating temperature range is wider. With state-of-the-art, high frequency / high efficiency circuit topology, the RSP-200 series run an active Power Factor Correction (PFC) function (PF > 0.95) and are up to 90% efficient. 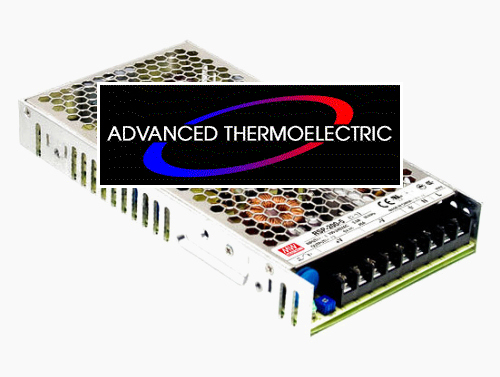 The series can provide full output power in ambient temperatures from -30 °C up to +50 °C (122 ºF). Cooling is silent, fan-less, natural convection. The RSP-200 series will operate up to +70 °C with some de-rating (see data sheets). Built-in functions include: fan speed control; protections for short circuit; overload; over voltage and over temperature. All versions comply with UL, CUL, TUV, CB, and CE regulations ensuring users' safety. RSP-200 is also CCC approved (China Compulsory Certification). To meet the needs of LED display manufacturers, and others, seeking both a low profile design and low output voltages, the RSP-200 series is available in 2.5V, 3.3V, 4V, and 5V (60A) models for optimal selection. The RSP-200 series is available in a wide range of additional output voltages that include 2.5V, 3.3V, 4V, 5V, 13.5V, 27V and 36V versions. Contact us for price and lead-time for these. The RSP-200 Series is widely used and applications include general industrial automation and control systems, mechanical and electrical equipment, instrumentation, LED displays, or any system that requires a low profile or silent, economical power supply.